Kenya's opposition leader rejected talks with the president on Tuesday, describing an invitation to meet as "public relations gimmickry" that would undermine attempts to end the ethnically-charged election standoff that has killed more than 500 people. Intensifying the diplomatic pressure from the United States, Sen. Barack Obama phoned the opposition leader "to express grave concern over the election outcome," Raila Odinga's spokesman, Salim Lone, told The Associated Press. Lone said Obama, whose father was Kenyan, also said he planned to call President Mwai Kibaki. Obama's spokesman, Robert Gibbs, said the senator spoke to Odinga on Monday for about five minutes before going into a rally in Lebanon, N.H.
On Monday, Kibaki invited Odinga to his official residence for a meeting Friday, but the opposition leader declared Tuesday he would not attend. He said any meeting between the two would be "public relations gimmickry" on Kibaki's part. Previously, Odinga had said he would go to the meeting only if it were part of international mediation efforts. 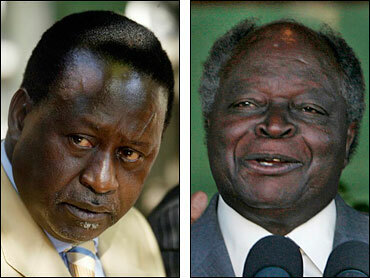 He charged Tuesday that Kibaki was "trying to deflect attention from and undermine" from international mediation. The Catholic bishop of the town where dozens died when a mob torched a refugee-filled church said Tuesday that the attacks against members of Kibaki's Kikuyu tribe appeared planned and organized. Bishop Cornelius Korir spoke in western Eldoret, scene of the fiery massacre of Kikuyu. Eldoret and surrounding areas have seen an exodus of Kikuyus since. The violence across the country has killed some 500 people. "The way the attacks were managed seems to me very organized," Korir said as the U.S. envoy, Jendayi Frazer, toured the region Tuesday. "No, it did not seem spontaneous to me ... It seems it was well planned." Kibaki's government also has charged the attacks were orchestrated, and both sides have traded accusations that the violence amounted to genocide or ethnic cleansing. Frazer rejected that allegation on Monday. "We would not agree that what has happened - even the worst of what has happened - has been a genocide," she said. Frazer, the top American envoy to Africa, says the vote count at the heart of the dispute was tampered with and both sides could have been involved. "Yes, there was rigging," Frazer told The Associated Press Monday in Nairobi. "I mean there were problems with the vote counting process." She added: "Both the parties could have rigged." She said she did not want to blame either Kibaki or Odinga. Kenya's electoral commission chairman Samuel Kivuiti has himself said he is not sure Kibaki won, though the chairman officially declared Kibaki the winner in the closest presidential election in Kenya's history. Kenya, which is crucial to the United States' war on terrorism, has turned over dozens of people to the U.S. and Ethiopia as suspected terrorists. The country allows American forces to operate from Kenyan bases and conducts joint exercises with U.S. troops in the region. The U.S. also is a major donor to Kenya, long seen as a stable democracy in a region that includes war-ravaged Somalia and Sudan. Aid amounts to roughly $1 billion a year, said embassy spokesman T.J. Dowling. Frazer said the violence "hasn't shaken our confidence in Kenya as a regional hub." The violence has marked some of the darkest times since Kenya's independence from Britain in 1963, with much of the fighting degenerating into riots pitting other tribes against Kibaki's Kikuyu, long dominant in politics and the economy. An official in neighboring Uganda said 30 fleeing Kenyans were thrown into the border river by Kenyan attackers, and were presumed drowned. Two Ugandan truck drivers carrying the group said they were stopped Saturday at a roadblock mounted by vigilantes who identified the refugees as Kikuyus and threw them into the deep, swift-flowing Kipkaren River, said Himbaza Hashaka, a Ugandan border official. The drivers said none survived, Hashaka said. A statement Monday from the Ministry of Special Programs put the death toll at 486 with some 255,000 people displaced from their homes. The toll, which did not include the drownings at the border, was compiled by a special committee of humanitarian services set up by the government which extensively toured areas most affected by riots.